Here’s a little project that I was messing around with in the craft room the other day. It turned out so cute (and was so easy) that I just had to share. These little bunnies would be a great project to do with kids since really the most difficult part was cutting out the ears. 1. 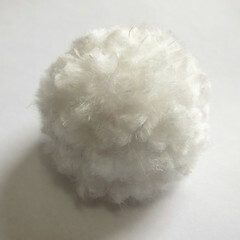 Make a pom-pom for the body. I use the fork method. I used a serving fork which is bigger than a dinner fork and got pom-poms that were about 2″. 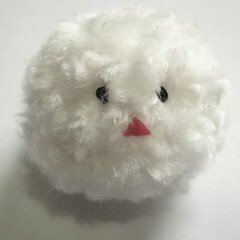 The trick to getting a thick plush pom-pom is to wind the yarn tight and lots of time, 60 – 70. Then trim the heck out after you have cut the loops. 2. 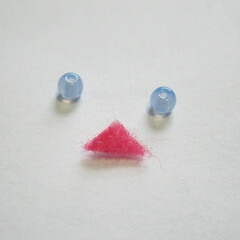 Cut a small triangle of felt for the nose and pick out two beads for the eyes. You want the eyes to stand out so pick beads that will show. For the brown bunny I went with a shiny, light blue bead. Glue the beads pushed into the the pom-pom and the nose underneath them. I found opening a spot for the eyes with a pencil or knitting needle point gave me a nice place to glue them in. I like the look of having them rather close together. 3. 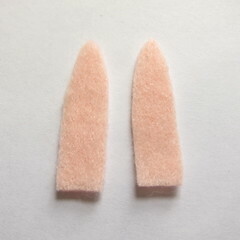 Cut out two ears from felt and glue them to the top of the head pushing them into the center of the pom-pom. As with the eyes, I found pushing a section of the pom-pom open first helped. I kept my ears really simple put you could do a matching ear with a pink center too. 4. 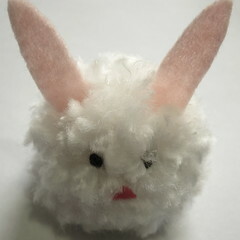 Add optional feet to the bunny by cutting out a heart shape from the felt and gluing to the bottom of the pom-pom. 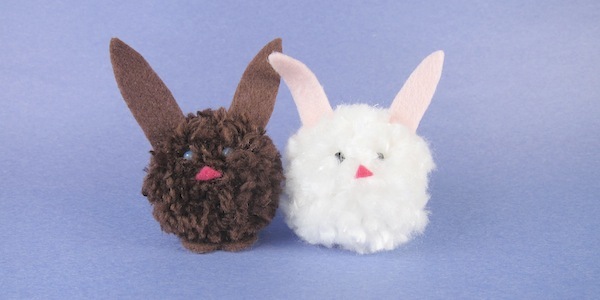 I did this for the brown bunny, but left them off the white one (mainly because I didn’t have any white felt). 5. 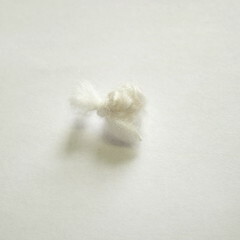 Knot a piece of the yarn in the same place until you get a knit that is 1/4″ – 1/2″. Glue to the back for a tail. 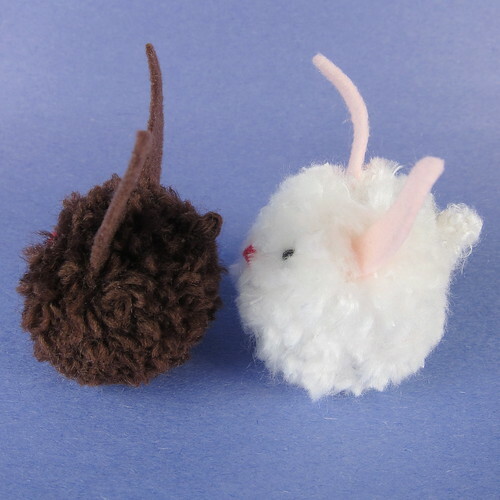 You could also by tiny pom-poms for the tails, I think making one this small would be quite hard. Use them as table decor or if you have a Easter tree (do people still do that?) they would make fun ornaments. 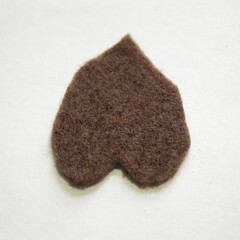 Put them on a floral pick and add them to a spring flower display or string a whole bunch for a garland. 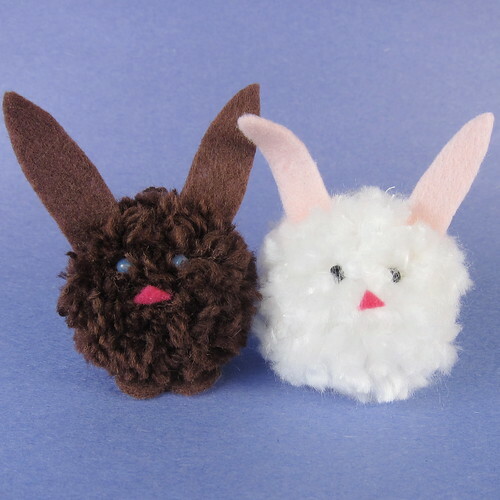 6 years ago by Kat in Craft Projects , Crafting with Kids , Crafts , Easter , Holiday , Projects | You can follow any responses to this entry through the RSS feed. You can leave a response, or trackback from your own site. Aww, these bunnies are just so adorable! Perfect Easter craft!